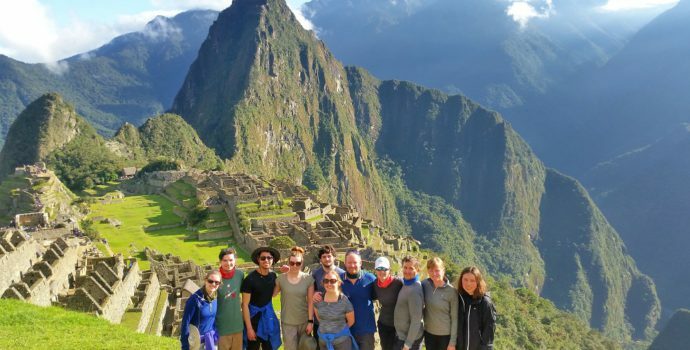 Start your adventure on Day 1 as you get picked up at Cuzco airport and meet your group! Discover the city on Day 2. Experience an unforgettable 3 day journey full of mountain biking, river rafting, and ziplining, ending at the one and only Machu Picchu on Days 3-5! Have a Cuzco free day on Day 6 with the options of visiting Rainbow Mountain or going on a quadbike or rafting tour. On Day 7, visit Lake Titicaca. On Day 8 we make our way to La Paz. 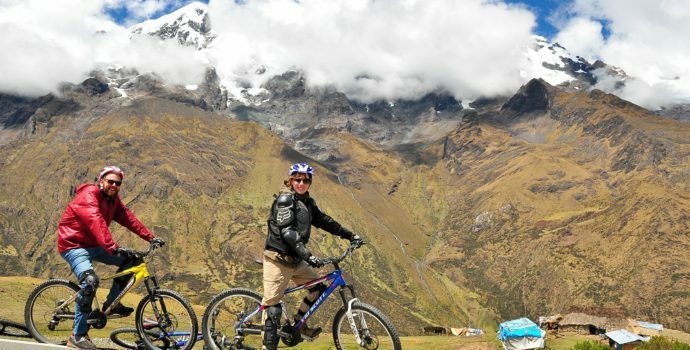 Discover La Paz or go on an optional Death Road bike tour on Day 9. 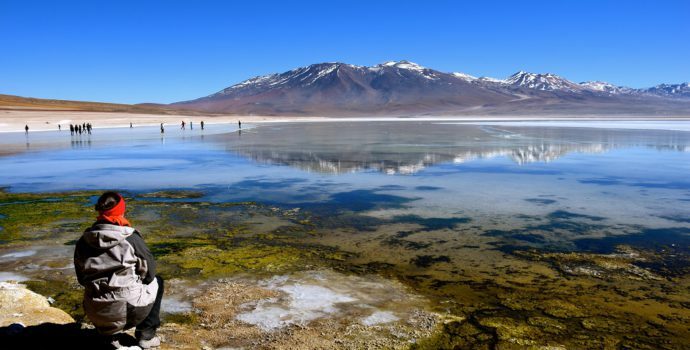 Head out for a once-in-a-lifetime journey through the breathtaking Uyuni Salt Flats on Days 10-12. Return to La Paz on an overnight bus and enjoy a free day to recover from so much adventure on Day 13. Your journey ends on Day 14 with a La Paz airport drop-off. Bienvenido and welcome to Peru! Today you will be picked up at Cuzco airport upon arrival and transferred to your accommodation for check-in. Meet your group and your Bamba Happiness Leader in the lobby at 6 pm for an orientation meeting. Tonight you will head out with the group to get a feel for this amazingly historical city. Check out the local restaurants with your new friends and make sure to compliment your savoury Peruvian dinner (not included) with some pisco sours! Overnight in Cuzco. Today you will discover the magic and beauty of Cuzco, the former capital of the Incan Empire, once considered the navel of the world. You’ll have the day free to explore the city at your own pace. 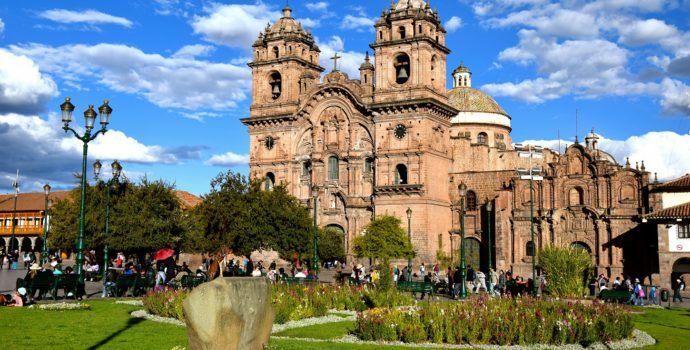 Walk through the cobblestone streets built atop ancient Inca pathways and imagine yourself walking among the ancient Inca roads that once led to the modern day Plaza de Armas from faraway lands. Stroll around town in the evening with your fellow travellers in search of flavourful Peruvian treats (a fresh ceviche, perhaps?) for dinner (not included). Overnight in Cuzco. Today we leave Cuzco around 6:30 am to drive 1.5 hours to Ollantaytambo, where we can buy a quick breakfast and some snacks. We then continue driving for another 1.5 hours up to the Malaga High Pass (4,350 meters), where our guide will provide us with a safety briefing before we begin an adrenaline pumping, 2.5 hour bike ride down into the lush Peruvian jungle. Along the way we will see the stunning and remote Huamanmarca archaeological site and cruise through fruit plantations and over rivers before arriving to Santa Maria village (1,400 meters) around 2:00- 2:30 pm. From here we will depart on a 2-hour rafting adventure down the Urubamba River that is as fun and exciting as it is beautiful, taking us down class III & IV rapids. Finally we’ll drive to Santa Teresa (1,600m) to enjoy a well earned sleep at a rustic guesthouse. This morning you’ll begin the day in the best way possible- flying through the treetops on a 2-hour canopy excursion on South America’s highest canopy zip-line. Traverse over 2,500 meters of cables with the longest ride covering 400 meters and the highest at 150 meters, soaring over unforgettable views. After the canopy adventure you will take a car to Hydroelectric Station where you will stop for lunch. 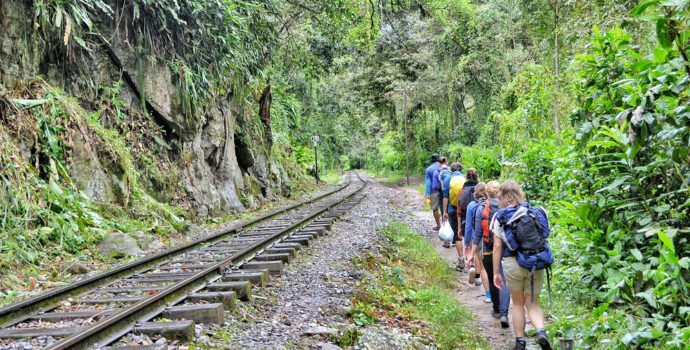 Continue 3 more hours on foot walking by the train tracks on beautiful green lush forest to reach Aguas Calientes walking along the train tracks for the true Machu Picchu trekking experience. You’ll see other backpackers making the same famous pilgramage through these ancient and beautiful Andean routes. In town there are internet cafes, cafes with board games and cards, and plenty of shops and places to relax with your new friends. Overnight in Aguas Calientes and enjoy a hot shower and a good night’s sleep. This morning we will catch one of the first buses (5:30 am) to Machu Picchu in order to appreciate the magnificent ancient city and one of the wonders of the world in the early morning light as the mist dissipates. Your guide will take you on a 2-hour tour of Machu Picchu, the most spectacular (and not to mention one of most popular) archaeological site in all of South America, walking you through the most important sites and covering the history of the place. After the tour you’ll have free time to explore on your own and take pictures at your leisure. You can also opt to take a hike up the steep peak named Huayna Picchu, from where all the most famous photos of Machu Picchu are captured! This sometimes muddy peak takes about 45 – 60 minutes to hike up and rewards you with unforgettable views of Machu Picchu from a coveted perspective. After an unforgettable day exploring this sacred place, we’ll return to Aguas Calientes by bus. If time allows, we’ll visit the local marketplace next to the train station and shop until the train whistle blows, signaling your return to Ollantaytambo. From Ollantaytambo, we will take a bus back to Cuzco arriving around 10:30 pm. Overnight in Cuzco. Today you’ll have the option of participating in some exhilarating activities. Feel the adrenaline rush of having total control of a 4×4 quadbike as you drive yourself along dirt roads in the mountains, splashing through mud puddles, passing fields and villages and enjoying the fresh crisp Andean air. 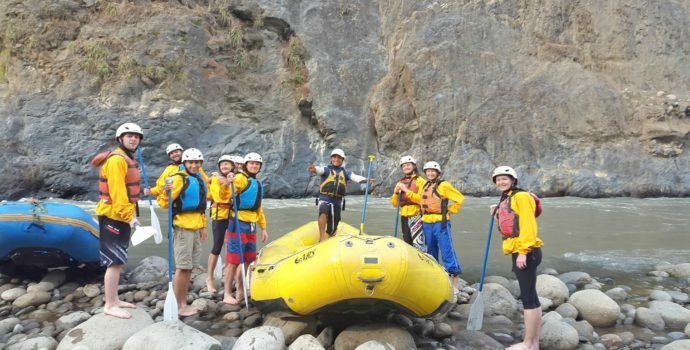 You also have the option of river rafting to experience the Peru’s natural beauty by river. If thrill-seeking isn’t for you, you can visit the magnificent Rainbow Mountain and marvel at the striking colors of the mountain. Make the return trip to the town of Cruz Pata where we’ll get in vans to take us back to Cuzco, where we’ll catch an overnight bus to Puno at 22:00, on the shores of world famous Lake Titicaca. * Note: Return time is an approximate only and afternoon tours may face some delay due to traffic going back to Cuzco. After an early arrival in Puno we’ll head out to discover Lake Titicaca, one of the most beautiful lakes in the world. Visit the Uros floating islands. Stepping on these incredible islands feels very much like walking on a waterbed (but don’t worry, it’s quite safe). 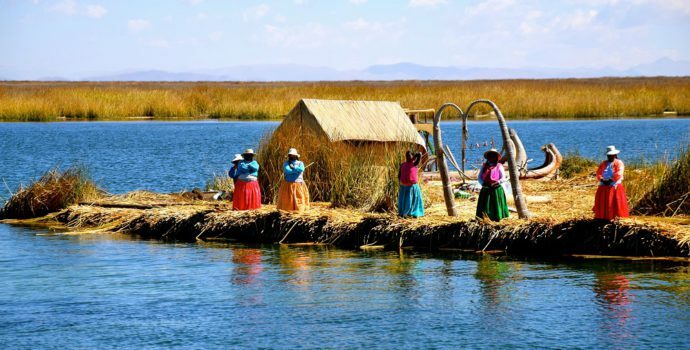 There are more the 90 Uros floating islands, but you will only visit two of them today to see the local way of life. 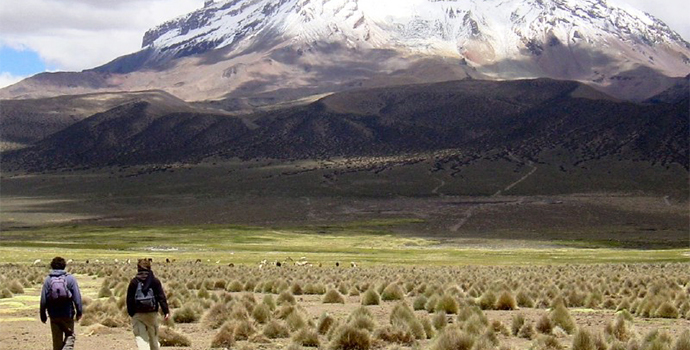 Next, cross the border from Peru to Bolivia and enjoy the scenic route along the way. 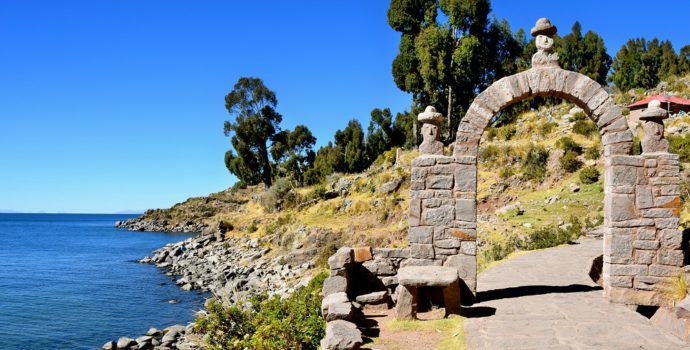 Arrive in Copacabana, take a boat to Isla del Sol (Sun Island) and explore this mythical place. Enjoy the rest of the day exploring the island and have dinner (not included) as you make your way to your accommodation. Overnight on the Island. Explore Isla del Sol before heading back to Copacabana to take a ferry across the Strait of Tiquina. Enjoy the impressive views from the water before catching an afternoon bus to La Paz. Upon arrival you will have free time to venture around town on your own. Overnight in La Paz. Enjoy a free day to partake in nearby activities. If you’re an adventure lover, ride the Most Dangerous Road to get your adrenaline pumping. Cruise along this infamous dirt track, navigate hair-raising curves with sheer vertical drops, and witness sweeping views of the valley below. 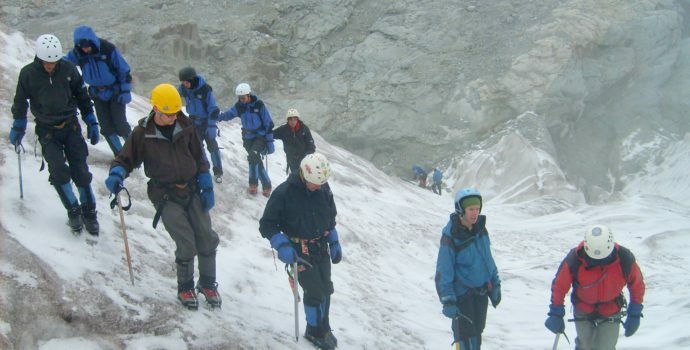 Begin the adventure in La Cumbre (4,700m) and descend 3,500 meters in approximately 4 hours, passing high altitude snowy peaks, beautiful waterfalls, and lush jungle scenery. Overnight bus to Uyuni. Arrive at the Uyuni bus station and make your own way to the meeting point of the tour (within walking distance). Start off your 3D/2N tour at 11 am with a visit to Uyuni’s ‘train graveyard’ to see the first locomotives in Bolivia. 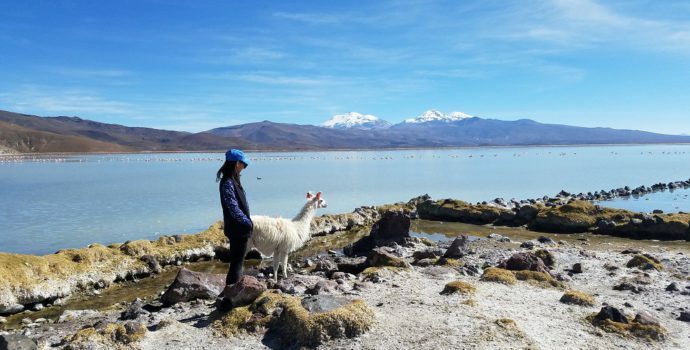 Then we will visit the small village of Colchani to visit a salt factory where they process the salt mined from Uyuni, have lunch, and enjoy some free time to explore the local museum or shop for souvenirs. 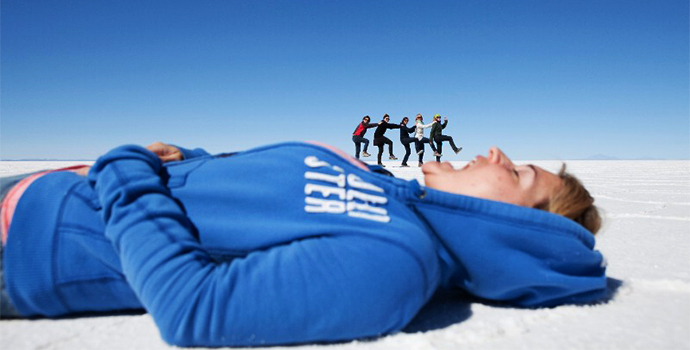 Next we will continue to the great salt flats of Uyuni. Take photos as you cruise along the vast white expanse of salt, and visit a hotel made completely of salt. Next we will visit Incahuasi (Fish Island) where you will have time to take a hike to the top of the island to see giant cactus and rock formations made of petrified coral. Enjoy the stunning sunset over the salt flat before spending the night at the tiny village of Atulcha in a salt hotel. Start off at 7:00 am for breakfast at the hotel and then head toward the villages of Julaca and San Agustin where we will take a short walk to the Sora Canyon to observe incredible views and flocks of llamas. Our next stop is at the Volcan Ollague viewpoint, where we will have lunch before heading to the beautiful Andean lagoons inhabited by 3 species of Andean flamingos. Visit the Desert of Siloli at 4550m (the highest and driest in the world) and take a photo next to the ‘Rock tree’, a lava rock formation. 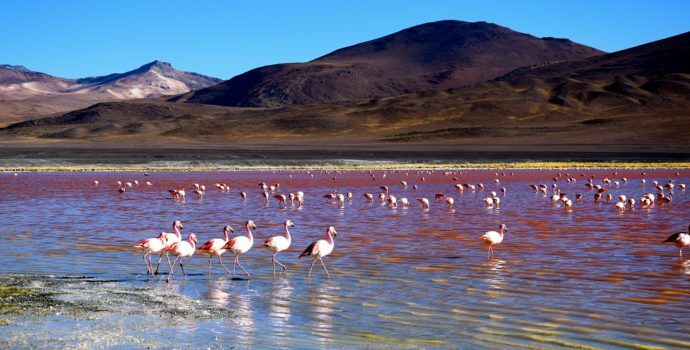 Before arriving to our final destination today, we will stop at the overlook point by the Red Lagoon to see more pink flamingos and admire this intense red-colored lake, and then at the Sol de Mañana geysers. In the evening we will enjoy the open air hot springs and take a bath in naturally 35 Cº water before spending the night in nearby Polques. Upon arrival in La Paz check into your accommodation and enjoy a free day at your leisure to recover from the incredible adventure you’ve just had in one of the most unique natural landscapes in the world. 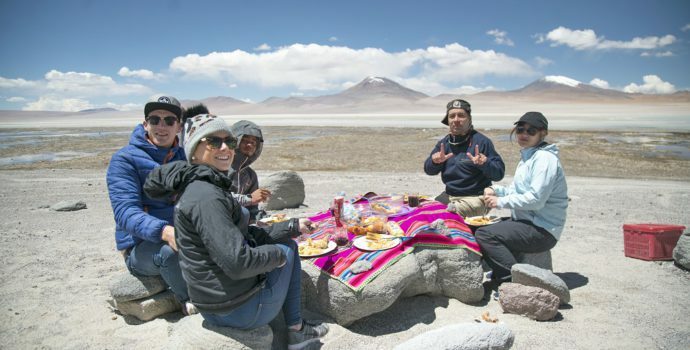 Discover La Paz with your guide, head out to sample Bolivian cuisine, and hang out with your new friends. This evening have dinner (not included) to say goodbye to all your friends that you’ve experienced so much with in the past weeks. Enjoy traditional Bolivian fare, sip some Piscos, and maybe even spend the night on the town after dinner to make the most out of your last night. All good things must end. Make sure that you exchange contact information with your new friends, you’ll have a lot to reminisce about! Your adventure will end upon after checking out of your accommodation. We wish you a safe journey onward! Single Supplement Available Upon Request, Entrance Fees in Sajama (400 BOL), Other Meals/Drinks, Tips, Personal Expenses, Travel Insurance, International Flights.